I bet you were glad to get that pretty apron from Mary. She’ll start her new job Monday. She’s going to drive a street car. We went to the show together today. My first reaction was, “a woman street car driver?” I then noticed the date – March 26, 1943. This puts the message right in the middle of World War II (1939 -1945). The message is a reminder of the contribution woman made on the home front to fill the gross shortage of manpower created when men went off to fight World War II. Women were once again given the chance to not only earn the men’s higher wages, but prove they could do the same jobs as men; something women still struggle to prove today to a certain extent. ** If you liked this historically significant blog post, please click on the bookmark button to the lower right. 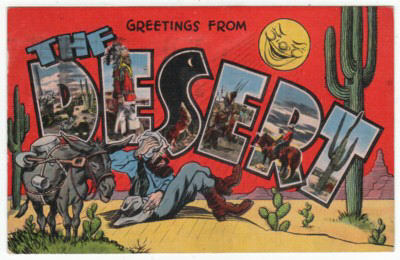 It’s Spring Time (On Postcards)! It’s time we celebrate the end of winter (no more snow, yea!) and beginning of spring. Antique and vintage postcards do this beautifully with their colorful array of flowers- from daffodils and iris, to crocus and pansies. The Lady Slipper usually blooms in late June or early July. I know that’s not spring, but how can I pass up showing off this bit of nature’s beauty now after several months of snow and lack of color? 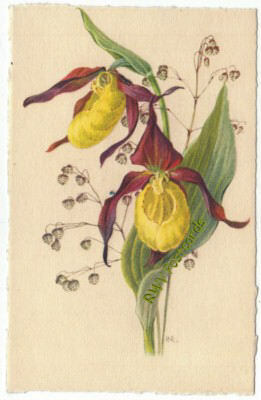 Switzerland published vintage postcard, signed by artist P.R., of a Lady Slipper. The Showy Lady Slipper (pink and white) is a rare orchid. On Prince Edward Island, it was so rare that the Pink Lady Slipper replaced it as the provincial flower. This orchid became the state flower of Minnesota in 1902. 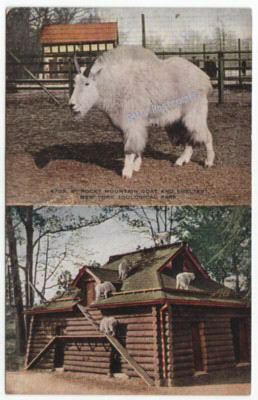 It has been protected in Minnesota since 1925. The above Lady Slipper is a White Lady Slipper. Note: 100 years ago, Lady Slippers were a favorite adornment of church alters. 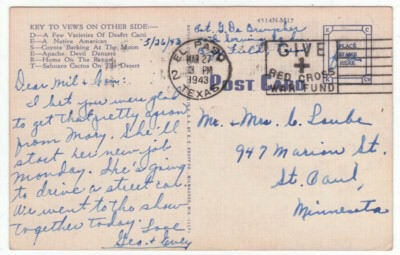 ** If you liked this blog post about the Lady Slipper postcard, please click on the bookmark button to the lower right. You can find more great flower postcards at Remember When Vintage Postcards. Every once in a while, I find myself puzzled about the things people during the late 1800’s believed in. 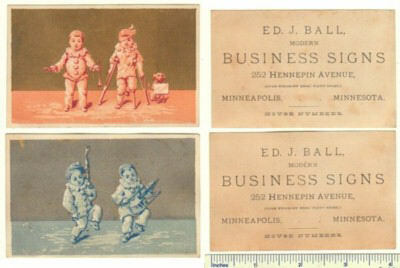 In this case, the curative properties of Burdock’s Blood Bitters (or BBB) advertised on this Victorian trade card. Burdock Blood Bitters was a patent medicine made by T. Milburn & Co. of Toronto until just prior to the repeal of prohibition. What are blood bitters? It is a liquid used in the making of alcohol cocktails. Hmmm. No mention of a medicinal ingredient. This is surprising since blood bitters were often marketed as a cure for female “miseries”. What is not surprising is the mention of alcohol (a prime ingredient in many patent medicines of the late 1800’s). What is burdock? It is the sticky weed balls that get stuck to pets. Turns out burdock roots have been a favorite medicinal herb for centuries. For example, they were used in remedies for constipation, hair loss, and as a blood purifying agent. Burdock roots are still being sold as an ingredient in acne medicine. As an added note, BBB contained nearly 20% alcohol. It seems like this “medicine” was a great way to hide alcohol consumption during the temperance movement and prohibition. It is more likely people bought this medicine for the alcohol, than for its so-called curative properties. ** If you like this blog post, please click on the bookmark button to the lower right. 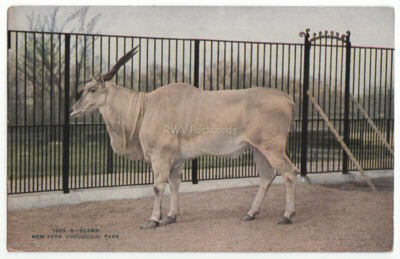 It’s time for more zoo animals on vintage postcards fun. Let’s continue our visit to the New York Zoological Park. For those who’re just joining us, this is the zoo that resulted from Fordham University’s selling the land it sits on to New York City for $1000. So far, we’ve visited elephants, brown bears, and arctic foxes, giraffes, and the hippopotamus. 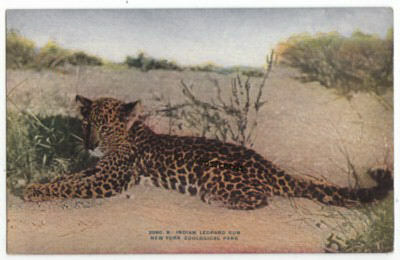 Today’s vintage postcards picture the Indian Leopard, and Malay Tiger. 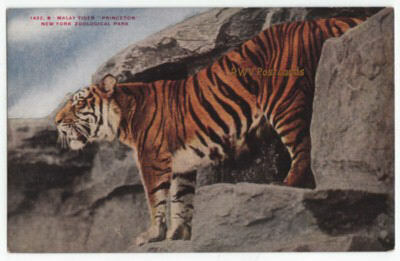 NY Zoological Park Vintage Postcard of Malay Tiger "Princeton"
The Bronx Zoo (formerly known as The New York Zoological Park) has another wonderful page of interesting info on this endangered animal, the tiger. For instance – this big cat’s tail twitches when on the prowl. I was saddened to learn while reading this page, that half of all tiger cubs die within two years. Be sure to check out the web page of your local zoo. It too might have pages of interesting info on it’s exhibited animals. The Minnesota Zoo, my local zoo, has a wonderful exhibit on the almost extinct Amur Leopard. I make sure to visit it each time I go. The leopard avoids tiger territory. The leopard is an excellent stalker and tree climber, who will descend head first (unlike most cats). They have also been known to leap out of a tree onto their prey. Yikes. 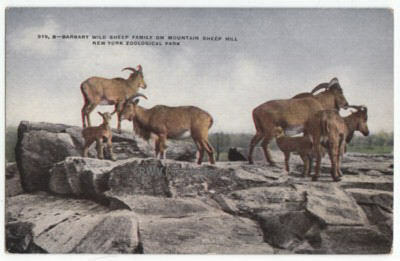 Be sure to come back for the last day of our visit to the New York Zoological Park, Wednesday 03/03/10, to find out which animals on vintage postcards will be visited. ** If you liked this blog post zoo visit, please click on the bookmark button to the lower right.